One of the handful of joys that blogging brings me is the opportunity to get to know a lot of people who have a similar interest in the relationship between religion and politics. I met up with one of these friends a couple of days ago during a rare day in London. It’s always helpful to share thoughts on the implications of what’s currently in the news and our discussion quickly turned to the subject of Europe and the Leave.eu/Vote Leave campaigns. We are both fairly close to the centre ground politically, but I’m more inclined to think that leaving the EU will favourable than he is. It’s not that he has a strong desire to stay in; it’s more that he hasn’t found himself being persuaded either way so far. The thing is, as we discussed, when it comes to 2017 we’ll all be left forced to choose one of two options: stay on the fence and let others vote to determine our country’s fate, or take the plunge, make a decision and vote accordingly. For those who believe that the choice to vote is as much of a duty as a right, opting out of such an important referendum is not a acceptable option. As we’ve been told on several occasions, Christians are more likely to vote than other members of the public and that is why the Church of England and Church of Scotland’s Reimagining Europe blog is a such an important resource. Here we can find intelligent and informed comment from leading writers on the future of Europe from a Christian perspective. This is just the sort of thing needed to help confused and undecided Christians (and others) make up their minds as to which way to cast their precious vote. The only downside is that the site quite deliberately leaves the reader to conclude which arguments are most persuasive, whereas plenty of people would like a bit of sagely advice to nudge them in a certain direction. It’s not difficult to see which factors will ultimately influence most people’s decision. Trade, national sovereignty and of course immigration are impossible to ignore. Right now, with everything that has gone on over the summer and following Theresa May’s controversial speech at the Conservative Party Conference, immigration is gaining even more attention than it usually does. Out of the key issues at May’s General Election, immigration came fourth after the NHS, the economy and education. It is a thoroughly divisive subject surrounded by claims and counter-claims, misinformation and ignorance and yet it has hardly received a mention at Reimagining Europe so far. Immigration is hitting the headlines day after day and but thoughtful Christian comment on it is sadly lacking. 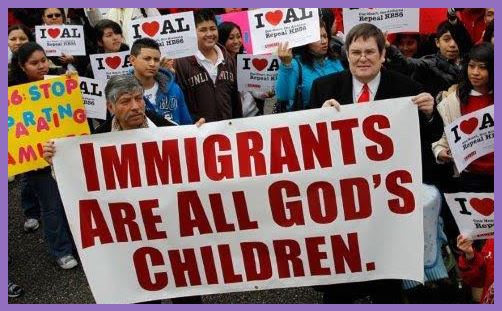 In my experience, Christians on the whole try to see the good in all people, so labelling immigrants as an unwelcome swarm doesn’t go down well. Jesus tells us that everyone is our neighbour and that we should treat each person with love and compassion as the story of the Good Samaritan sets out so clearly. But does that automatically mean we welcome anybody who arrives on our shores with open arms? When we have net immigration running at 330,000 a year, whatever our views are on this matter, we can’t get away from the increasing pressures being placed on our public services as our population expands at a rapid rate. There’s also the question of whether all migrants should be treated the in the same way. During the last year, 183,000 EU citizens arrived in the UK. The number from outside the EU was even bigger at 196,000. In comparison, the number of asylum applications was only 25,771. Are these volumes and proportions acceptable and if not what is a fair and just way to decide who is welcome and who is not? Although it is unrealistic to expect one-to-one correspondence, it seems that the biblical gēr can most closely be identified with today’s asylum seeker or refugee. The Bible’s concern for the gēr is reflected in the number of times they are mentioned – almost always in the context of vulnerability and need. Many economic migrants may also fall into this category, since they have left their country of origin due to some degree of hardship or limited opportunity, and settled for the long term in the UK – often taking on low-paid jobs that native Britons are unwilling to do. The noḵrî is associated with those whose visit is temporary and whose allegiance ultimately line elsewhere. The foreign student would generally fall into this category, along with some wealthier economic migrants whose relationship with the country could be viewed as short-term and even exploitative. To these we might plausibly add multinational companies which operate in the UK but are domiciled elsewhere or have arrangements in place to avoid paying taxes here. Additionally some British-born high net-worth individuals actually choose to be domiciled elsewhere so that they can avoid paying taxes here; they have essentially taken on noḵrî status voluntarily. The obligation to pay their way for those who are able, and for the Israelites to provide work, support and community for those who are vulnerable and dependent on them, is a simple yet profound guiding principle. It’s not difficult to see how this approach to the treatment of foreigners is as relevant today as it was a few thousand years ago. There is a well developed understanding of the need to shelter those fleeing persecution and violence. Ex-Lib Dem MP,Sarah Teather set out a biblical perspective on this two years ago and plenty of others have done so since. But when it comes to open doors immigration, we are finally waking up to the realisation that integration is not a happy and natural by-product of multiculturalism. People would generally rather live and spend time with others like them. We have too many insular communities living in this country who are not fully integrated into our society. We have not sustained a strong narrative of our own cultural identity and made few demands of those entering from outside. When outsiders settle, but then demand that they have their own parallel legal and education systems and that their cultural practices and attitudes are to be accepted without question, it is impossible for society to remain cohesive. The government’s current drive to promote British values, which although vague around the edges are underpinned by the Christian teaching and heritage that have defined us as a country for so long. They are an acknowledgement that if our nation is to function effectively as hundreds of thousands continue to arrive each year, we need to start laying down some markers and expectations of all who reside here. None of this provides a definitive answer as to whether we should leave the EU or not. Immigration is important, but it should not become the defining issue. Up until now we have coped with the numbers arriving and we should be able to for some time to come. We have more immigrants from outside than within and exiting the EU will make no difference in that area. If we stay then we will have to accept that we will have to work harder to keep our identity with all of the benefits that it brings. If we go then our future is in our own hands; there will be no one else to dictate who we let in, but if we reduce the numbers entering who we might class as noḵrî, then conversely that should mean we are able to serve the gērîm better. It cannot be an excuse to shut out the desperate and needy too – if anything, the opposite should be true. A reduction in immigration numbers should never result in a reduction in compassion. That is certainly not a British nor a Christian value.